Friday night’s battle between No. 1 Mater Dei and No. 15 St. John Bosco was like a good old-fashioned heavyweight fight with the two national powers going toe-to-toe for 48 minutes before the top-ranked Monarchs left the field with a 31-21 victory before a nearly packed house at El Camino College in Torrance, California. Mater Dei (7-0, 2-0 Trinity League) raced at to an early 14-0 lead on two Amon-Ra St. Brown touchdowns. The first score was a 12-yard pass from USC-recruit JT Daniels, his 23rd touchdown pass of the season. The second one came on a 51-yard punt return. The 5-star St. Brown also returned a punt in last year’s 26-21 regular season win over the Braves. Bosco (5-2, 1-1 Trinity League) didn’t fold down 14-0 with sophomore quarterback DJ Uiagalelei making his first varsity start. Uiagalelei connected with Josh Delgado for an 85-yard catch and carry that cut the lead to 14-7. 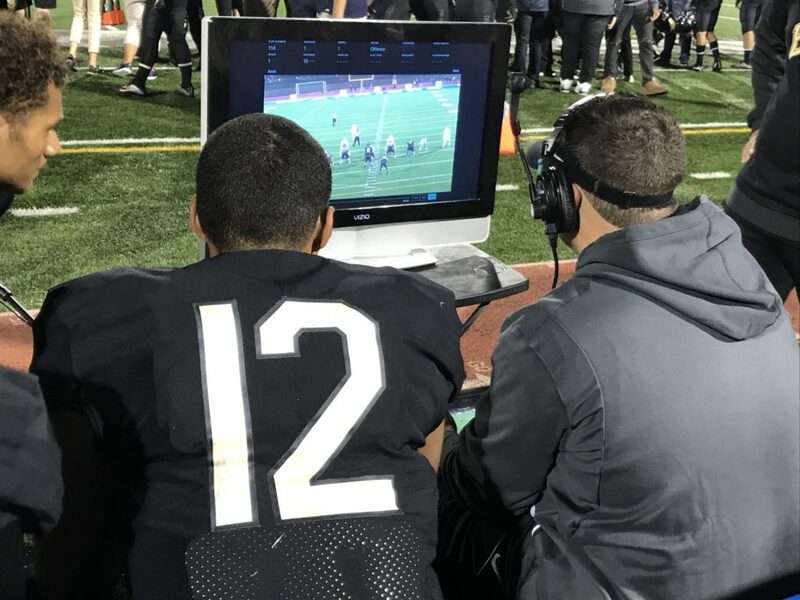 Bosco sophomore QB DJ Uiagalelei watching film between drives Friday night. Daniels and St. Brown brought the Monarchs right back on the next drive of the game. After a long pass between the two got the ball deep in Brave territory, Greg Harper found the end zone on 4th and inches to make it 21-7. But, once again, St. John Bosco super soph Uiagalelei used his arm to keep the Braves within striking distance. He hooked-up with Colby Bowman for 73-yards to cut the Mater Dei lead to 21-14. On the very next series, Daniels and St. Brown went to work again with the two connecting for their second score of the night that once again gave the Monarchs a two touchdown lead. St. Brown finished the night with eight catches for 201 yards. Bosco was able to close the lead to 28-21 at halftime on sophomore running back Keith Savage’s TD run, but that was as close as the Braves would get. Both defenses played extremely well in the second half with Mater Dei scoring the only points on a field goal. Maybe the most surprising stat of the night was the fact that Rollinson’s star QB rushed for 111 yards and picked-up several key first downs with legs. The 31 points is the lowest point total in a game for Mater Dei this season, which game into the contest averaging over 48 per contest. The Monarchs scored 70 in their win over Santa Margarita last week. The Mater Dei defense was outstanding with seven sacks of Uiagalelei. Solomon Tuliaupupu led the way with 2-and-a-half sacks. Now the big question is — will these two meet again like last season? Mater Dei won the regular season match-up in 2016 and Bosco came-back to win the CIF Southern Section championship by beating the Monarchs on their way to the CIF Open Division championship.